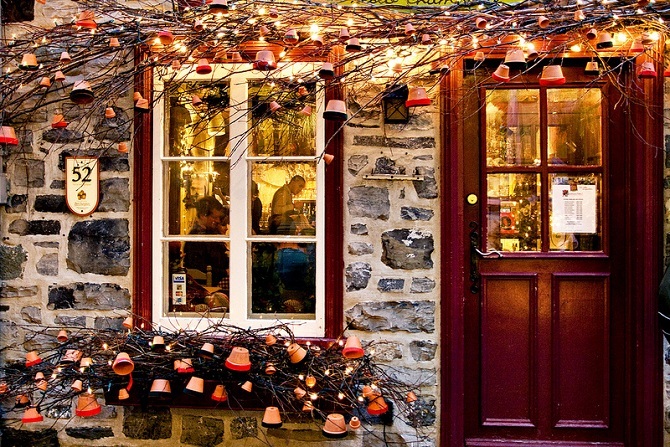 Québec City is known as Canada’s foodie paradise. With such a strong French influence in the city, it’s no surprise that Québec’s French restaurants are exceptional and well-known for their expert wine pairings. For a mix of fine dining restaurants, bistros, and little cafés, here is our pick of the best French restaurants to be found in Quebec City. Hidden away in a residential district, iX pour Bistro has quickly become a top restaurant in Québec City. Since there are only two staffers: the maître d’ and the chef, dining at iX pour Bistro is like dining at the home of two friends with a masterful knowledge of wine pairings and delicious food. Though the foie gras dessert may sound unusual, it’s an utter delight. As the restaurant is only open for dinner and does one seating per table each night, be prepared to settle in and spend a few hours enjoying unpretentious, delicious food in a homelike setting (if you’re lucky enough to snag a reservation). 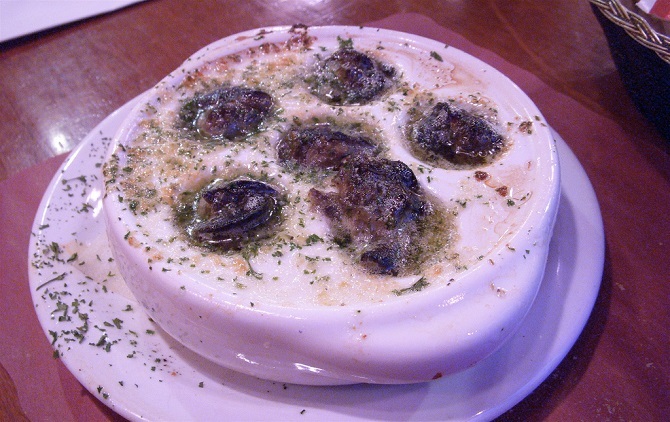 L’Échaudé is not just a favorite of visitors to Québec City, but is also highly regarded by locals. Reminiscent of a Parisian bistro in its atmosphere and décor, the restaurant’s highlights include rack of lamb, bison, and its stunning crème brûlée. The staff are very knowledgeable about both the menu and the wine list, absolutely necessary with such a widely varied menu. Since it is so popular, reservations are generally a must, especially on weekends. But don’t be afraid to stop by the restaurant and see if there’s a table available, as people have been known to get lucky before. 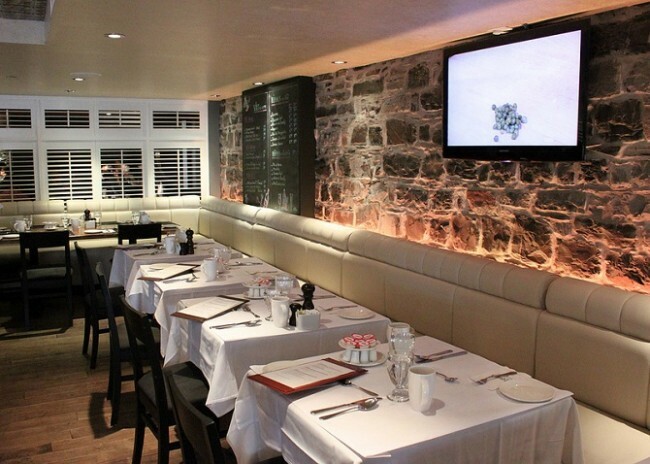 Restaurant 1640 offers a wonderful experience in Old Québec despite its unassuming appearance. Neither the fixed price menus nor the a la carte menus lack delectable dishes, as pizza and pasta share space with lamb shanks and duck confit, all well-presented. Their twist on the classic beef bourguignon is particularly excellent. Since it is situated below a small hotel, it serves all three meals each day. Bar and outdoor seating are both available. The atmosphere is quite casual, and the location, directly across from the Chateau Frontenac, is ideal for starting or ending a day in the Old Town. Informal, friendly, and unpretentious, L’Affaire Est Ketchup typically offers two sittings a night. The food is all locally sourced. Once each table has prepared its full order, everything is made on small stoves. Don’t be deceived by the restaurant’s appearance: dishes like the venison and kid goat entrées are beautifully presented and magnificently prepared. The staff can not only recommend excellent wines, but choice beers as well to pair with your meal. Since the menu often rotates, ask the staff what to choose if you’re feeling unsure, since they’ll never steer you wrong. As suggested by its name, Le Lapin Sauté specializes in rabbit. The décor suggests a ski lodge, but the outside terrace is also an excellent dining choice, as the restaurant will offer you blankets should the night turn chilly. French onion soup made with local Boréale beer is a great starter here. The best main courses include rabbit poutine, which uses a two-mustard sauce and Perron Cheddar curds, as well as the rabbit confit cassoulet. If you and your dining companions are feeling hungry, try their two-person duck and rabbit duet. The maple crème brûlée is an excellent dessert if you still have room for one! Located near Montmorency Park, Bistro Sous le Fort is best described as cozy with unique décor. Things like the sampler platter, which includes homemade bison and leek sausage, duck-pistachio rillettes, duck confit, and wild boar egg rolls are perfect for a light lunch. Their Brie, served hot with walnuts and maple syrup, is also an excellent starter. Well-received entrées include the duck confit legs, deer medallions and seafood casserole, but the true star here is the maple pudding. Served warm and moist without being soggy, this ‘pudding’ is really closer to a tart, but either way it ensures a sweet ending to a delicious meal. Le Saint Amour has remained as one of the premier French fine dining experiences in Québec since the 1970s. Its head chef, Jean-Luc Boulay, is a master chef with a long list of awards, and presented dishes at the Olympics in Vancouver. It may be a classic, but there are fun twists on dishes here. Lobster on squid ink pasta is one of the highlights available. If you’re unsure of what to choose, try one of the two tasting menus. Everything is presented as a work of art, including the setting, which evokes a romantic indoor garden. Le Quai 19 specializes in providing the very best fresh and locally sourced dishes. The menu is entirely dependent on what’s currently in season. As its name hints, the seafood dishes will not disappoint. Prince Edward Island oysters and grilled octopus are delicious appetizers. Their other signature dishes include a BLT tartare and blood pudding. Breakfast, brunch, lunch, and dinner are all served here. The atmosphere is warm and inviting, and the two owners are known to mingle with their patrons. If the weather is good, sit outside on the terrace; otherwise, choose the bar to watch the chef preparing your meal for you. Le Petit Coin Latin makes for an excellent breakfast stop in Québec City. It’s a real hidden gem off the beaten path and offers a bohemian feel behind its unassuming exterior. In summer, the back patio is open, and is surrounded by historic apartments. The menu is also wonderful for winter, with the filling Swiss raclette shining as a standout dish. Omelets, melt-in-your-mouth croissants, and café au lait served in proper French bowls are great choices for breakfast. Regardless of what you choose, you can get a filling, delicious meal without compromising your budget. Le Café du Monde overlooks the St. Lawrence River and is housed on the Cruise Terminal’s second floor. This place is a great choice for lunch, since the best views are to be had then. Seafood, as suggested by its riverfront view, is never a poor choice here. However, it’s mostly limited to the dinner menu. If you’re looking for great seafood, try their mussels. If you’d rather not have seafood, choose the braised lamb. The modern décor lends itself well to a warm, joyful atmosphere that’s also quite casual. Unsurprisingly, the wine menu is huge, but more surprising is the large cocktail list.